3 minutes a side in olive oil is all it takes! 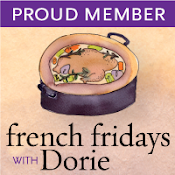 This week’s French Fridays with Dorie challenge is for Swordfish with Frilly Herb Salad. Although Swordfish is one of our favorite types of fish, we had this beautiful Blue Fin Tuna that I purchased from Fresh Fish Fanatics right off their boat in the Channel Islands Harbor. 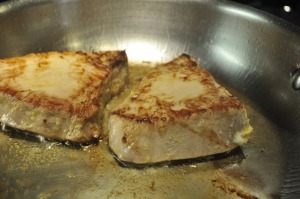 Since Tuna, like Swordfish, is a nice steak-like fish, it worked perfectly with this seasoning. The fish is marinated in a mixture of lemon zest, lemon juice, capers, caper juice, olive oil, and onions which is just delicious. The marinade is then cooked and served over the fish. We loved the flavor combination and think this would work really well en papillote with far less mess to clean up. Fresh herbs from our garden: Dill; Tarragon; Flat Leaf Parsley; Lemon Thyme; Oregano; and Chives. 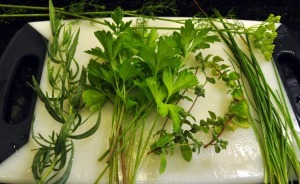 The Frilly Herb Salad called for 2 cups of Flat Leaf Parsley and an assortment of fresh herbs tossed with a touch of lemon juice, olive oil, salt, and pepper. However, we didn’t have that much in our garden and I couldn’t find any at the market, so I added in a little baby spring greens. Frankly, I would have preferred more lettuce and less parsley, but I did like the mix of herbs with the fish. The lemon and olive oil was a perfect summer dressing. All in all, a wonderfully refreshing summer meal. Huckleberry Finn & Tom Sawyer – cute brothers! Yours look great too! Tuna is a very appropriate choice too especially when you got your hands on such fresh supply! I’m pretty sure I would have liked this better with tuna. Well done, my friend! Beautiful dish and those kitties are adorable! love the names! That looks really good. The salad sounds yummy. And I love your cats!! They are so beautiful! Tuna was a great choice – and yes, this does work very well in packets (I cooked mine in foil). So pretty with the bright green salad. Well if I got fresh fish off of the boat I would have gone with tuna also, but if you like tuna, you have to try this recipe with swordfish some time. I really think it is a tastier and nicer textured fish than tuna, but I won’t be buying it often too $$$ and too much mercury. Such a fabulous salad, I love fresh tuna! Your kitties are too cute :). Ah! I adore blue fin and I think that would be my favorite over the swordfish even. How fortunate you had such a fresh piece for this dish! Unlike what Diane said I think the blue fin has a nicer texture. lol. To each his own I guess! Such a lovely photo of Tom and Huck too! I loved that! Those cats are adorable. Yes, this would work great with whatever is freshest, for both the fish and herbs. Very nice! 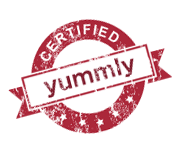 That looks great with the tuna – a perfect substitution! We could have done with less parsley too, but otherwise loved the meal. I also added fresh greens to some herbs…just not a fan of a salad consisting of just herbs. However, the fish was fabulous and so was the marinade…we totally enjoyed it. 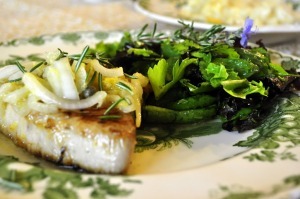 Yours looks wonderful…blue fin was a perfect substitute for the swordfish! 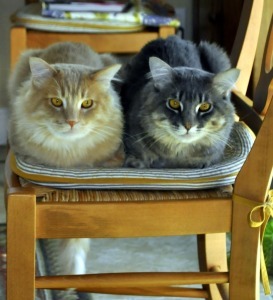 Love the photo of the cats…they are beautiful! I loved everything about this recipe except the herb salad. I liked the idea of it but not the parsley. It’s an herb, not a green. Although I added mache, it still didn’t taste like I expected it to taste. But the marinade was delicious and am glad to know it works with tuna also. My favorite fish.